Welcome greeting in a Bhutanese style with Tashi Khada (white scarf) by our representative & your guide at the Airport. You will be driven to hotel for refreshment and a brief discussion on your tour program. Paro Sights & Acclimatization Day! Visit the Rinpung Dzong. A flagstone path rises gradually from a beautiful wooden bridge with shingle roofing and abutted by two guard houses to the Dzong. Today, this massive fortress built in 1645 AD is the seat of the district administration as well as the home for the monastic school. The central tower( Utse) of the Dzong, with its superb woodwork, is one of the most beautiful in the nation. After a wholesome breakfast, you take a short drive to the ruins of Drukgyel Dzong. En route you can spot the Tiger’s Nest glued on a rocky cliff toward the right side of the road. This point is the dead end road of Drugyel village and many trek in Bhutan starts from here. You will meet your trekking crew who had been awaiting for you at this junction. We will walk along the Paro Chhu river valley, the trail passes the small settlements of Chang Zampa and Mitshi Zampa where we will see typical samples of Bhutanese farmhouses. Just before reaching our camp, we will have to pass through an army check post, where your guide will produce your trekking permit. We camp at Shana (2800m). On this acclimatization days, we have many day-hiking options. The first is a three to four hour excursion up the ridge to the north for great views of Jichu Drake. The second is to hike up towards the head of the valley in the direction of Jhomolhari. The third is a trek up the main valley towards the last house and onward toward Jichu Drake, this gives a great view of where we will be going in the next few days. The final alternative is a fishing expedition to Tshophu, a high-altitude lake about a two hour hike away. Starting early a strenuous hike leads to the Shinge La pass at 5005m. Descending to Lemithang we’ll see Mt. Gangchenta (6840m) and the glacially carved Gangchhenta valley. Gangchhenta means Great Tiger Mountain. We camp at 4140m. The trail climbs gradually following the main source of the Pho Chhu to Chozo village. At the small Chozo Dzong there are some lay monks. Above Chozo the valley opens as we approach Thanza village near the foot of 7100m. Zogophu Gamp, which is also known as Table Mountain. We camp at Thanza, 4080m. Today’s trek starts with a climb up to the ridge, from where there is a great view of Table Mountain and Thanza valley below. We cross the ridge, and enter a small valley with a stream running through it. Today’s trek is one of the highlights of the trip. The day starts with a short climb up to the Tashorim Lake. We walk around the side of the lake, enjoying the panoramic view of Gophula ranges. The final stretch Gupho-la pass (5,230m) is very short. After crossing the pass, we descend to the base camp, walking along the ridge and enjoying a great view of Gangkar Puensum. According to choice, you can detour left and climb up a pyramid shaped peak for a better view, or you can go directly to base camp (4,970m) near the Sha Chu, where we will set up the camp . The trek is not yet over. The trail follows along the Sha Chu river and descends gradually to Geshe Woma (4,200m) where we camp. The path continues along the course Sha Chu for two and half hours until the stiff climb to Saka-la begins. Visibility is poor along this part of the trail, so we must keep watching top of the ridge in order to stay on course. We stop for lunch near a yak herder’s camp, then climb up to Saka-la pass (4,800m). There are stunning views on the descent to the lakes and another short ascent leads to Wartangle-la pass (4,590m). 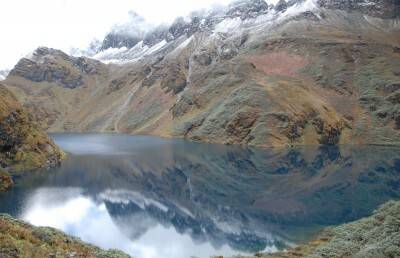 Scenery once again is stunning with small lakes and the mountain peaks. We camp at 4,000m. A short half-hour climb takes us up to Juele-la pass (4,400m). After crossing the pass, descend to the riverside through dense rhododendron, juniper and conifer forests. We then cross a bridge and after a short climb rech Dhr Tsachu hot spring, where legend has it that Guru Padsambhava bathed in the 8th century. You can soak yourself in the hot-spring and relax. This is the last day of the trek where you change from yak to pack ponies. WE must set off very early in order to reach Bumthang before dark. The path follows the Chamkhar Chu descending gradually with few climbs. The trek ends when we reach Dur village where transport will pick us up and drive to Bumthang. Dur village is known for its hot-spring. If you wish you can spend some time relaxing in the hot-spring which is known for its healing properties. Overnight in resort in Bumthang. (Alt; 2580m). After breakfast you leave Bumthang, the cultural heartland of the nation and drive to Punakha the former capital of Bhutan. The journey will take you over one of the most scenically beautiful routes in Bhutan via the Yotongla pass (3425m) & Pelela pass (3300), which is also the habitat for the Satyr peasant. Good for photography. En route visit Trongsa Dzong with its distinctive roof. Trongsa Dzong (fortress), built in 1645, is a vast, white fortress that appears to grow directly up from the narrow green ridge on which it is constructed. It is one of the most powerful Dzongs and even today the crown prince of Bhutan must first become its Trongsa Penlop (governor) before he can become Bhutan’s King. On arrival, visit the Punakha Dzong, “Palace of Great Happiness.” It hosts the administrative seat of the district. The Dzong lies between two rivers, the Pochu and Mochu, male and female river. It was built in 1637 AD It was here on 17th December 1907, Bhutan’s first king was crowned. This ancient fortress is considered to be one of the most beautiful by many. Punakha is the winter residence of the central monastic body and its Chief Abbot. Along the way, stop for tea at Dochula resort (3150m), where you can enjoy the spectacular views of the eastern Himalayan mountain range. From this point you can spot many peaks like Mt. Chomolhari, Mt. Jichu Drakey, Mt, Gangkhar Puensum, etc at a distant which you have left during you long trek. After walking around the 108 stupas on the pass drive to Thimphu. Thimphu is a small, charming capital city nestled in the heart of the Himalayas. It is nothing like what a capital city is imagined to be. Most of the houses and buildings are painted and constructed in a modern traditional Bhutanese style. Take a drive to Buddha Gang which offers a beautiful view of the valley of Thimphu city. Astrologers & locals believe this spot is one of the central meeting point of the sacred energy vibe of the country hence the massive statue of Buddha facing the sun. On the way down, circumambulate around the Memorial Chorten (huge stupa) built in memory of the late 3rd king. This is the favorite place for the locals of Thimphu to devote their religious practice. Walk around Hongkong Market/ Norzin Lam/ Central Plaza/ Clock Tower and shop for souvenir.